Back in November, I took a look at PBW, the clean energy ETF from PowerShares that tracks the WilderHill Clean Energy Portfolio. The fund holds positions in a variety of firms that are involved in alternative energy plays, from solar to fuel cell to wind. Above we can see how PBW has traded relative to energy firms (the XLE ETF) and to cash West Texas Intermediate crude oil itself. I have equalized the prices as of the start of March, 2005 to illustrate the different paths each has taken. While PBW may represent alternative energy, it is not a complete alternative as an investment vehicle. Since 2005, daily price changes in PBW have correlated .61 with the S&P 500 Index (SPY) and .53 with the XLE energy stocks, but only .16 with WTI crude. 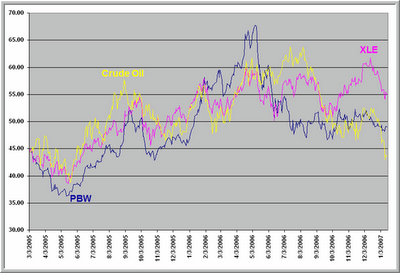 In other words, PBW seems to be more influenced by movements in the stock market than those in the crude oil markets. A look at the chart, however, suggests an interesting relationship among these three. During the runup in crude oil prices, PBW sharply outperformed XLE, reflecting concerns over rising energy costs in the wake of expanding consumption among emerging nations. Indeed, PBW has traded very similarly to the emerging markets, with a speculative runup in the March-May, 2006 period and sharp decline thereafter. Unlike the emerging markets, however, PBW has not bounced since that decline. With the recent drop in crude oil, PBW has markedly underperformed XLE, suggesting a waning concern with energy alternatives. In other words, in the relationship betweeen PBW and XLE we may have a nice sentiment gauge regarding worry over the price levels in the energy market and investors' speculative appetites. As an alternative investment, PBW is, by its very nature, a speculative vehicle. When investors are complacent about energy and favoring value/large caps over growth/smaller caps, we would expect PBW to not attract a great deal of interest. Conversely, when energy prices are soaring and money is flowing into small caps and emerging markets, investors would be likely to turn to PBW as an attractive theme. Within a "normal" level of crude oil prices, daily variations in crude would not greatly affect PBW. Once crude oil hits a pain threshold, however, we would expect enhanced interest in PBW, especially in a high liquidity environment that encourages speculation. Clearly, that pain has been missing in the past several months. Absent political initiatives that would alter the fundamentals of the alternative energy sectors, it looks as though it may take a Pickens-esque scenario of $70+ crude to keep PBW on investors' radar.